As I do with all my reviews, to get an objective opinion, I compared the view through these with my benchmark compact binoculars, that have a configuration of 10x26. The image produced was as clear and sharp as my benchmark, contrast was also about the same, which means that they are above average and as good as or better than any in their price range. The colour reproduction for a compact was good and the amount of colour fringing (chromatic aberration) around the edges of a dark object when viewed in front of a light background was extremely minimal, but no more than other binoculars in this class and only noticeable if you are really searching for it. The amount of softening of the image on the periphery of the view was almost none and is as good as or better than any binocular in this class. You usually have to pay for more to to achieve this in other binoculars. Comparing the brightness of these with my 26mm benchmark, I could hardly notice any difference, but if I had to pick one, I would say that these Minox binoculars just edged it. So where does this place them overall? Well I would say that for a compact it places them in the top tier in terms of brightness. I have seen brighter pairs, but only just and considering that they have smaller 25mm objective lenses, the brightness of the image is impressive. There are many factors that combine to produce the final image brightness. These include the size of the objective lens, quality of glass, their coatings and the physical assembly and quality of the prisms. 10x25 binoculars like these have an Exit Pupil of 2.5mm and a Twilight Factor of 15.8, which suggests that poor light performance is not these or indeed most compact binoculars strongest point. I would however like to add that I often used my compacts, instead of a larger binocular because I also carry other equipment and need a very compact pair. This is often at dawn and dusk when the lighting is pretty poor, using them for both birdwatching and wildlife observation and whilst it may be preferable to have a larger binocular with better light gathering capabilities, they are still far better than having no binoculars at all. The Minox BV 10x25 BRW's use BaK-4 roof prisms which means that not only are they are made of superior optical glass that help produce clearer images. All glass to air surfaces have been multicoated meaning that these are fully multi-coated optics,which you want on your optics and helps with light transmission to produce a bright image without interfering reflections. Their field of view at 1000m is 96m (290ft at 1,000yds), which for a 10x compact binocular is very good and not only competes with, but beats some of the very best binoculars like the Swarovski Pocket 10x25 B Binoculars (95m at 1000m) or the Leica 10x25 Trinovid Binoculars (273ft at 1000 yds). Close focusing distance is 1.5 meters (4.92 ft), which again is excellent and will work well for something like viewing butterflies and other insects at close distances. The extremely sturdy aluminum body that is covered in a hard rubber armour not only makes these a tough binocular, but helps keep the weight to a minimum. In fact they weigh just 9.14oz (259g) and like the excellent Leica 10x25 Trinovid Binoculars ( 9ozs (255g), they some of the lightest binoculars I have ever reviewed. The dimensions 4.29 x 3.85 x 1.53 in. / 109 x 98 x 39 mm of this Minox 10x285 makes them as small as any compact out there when in use. Compacts with double hinges as apposed to the single hinge on this design are able to fold up into a more compact shape than these however, which may be important to some. For more take a look at an article I wrote on the Best Compact Pocket Binoculars. Overall I really like the way the Minox BV 10x25 BRW Binoculars feel in your hands and despite that the fact that they are very lightweight, they have a really solid feel to them that reinforces the feeling of quality. As far as compacts go, they nicely balanced and I like the tough rubber armour that surrounds the barrels that will not only help to protect the binocular from any bumps and scratches that come with day to day usage, but will also dampening down any noise from something bumping against them. To many this may not seem important, but sometimes any metallic sound could easily frighten away skittish birds and other wildlife and is something that I often accidentally do with my wedding ring. To focus the binocular, you use the central focusing wheel which turned very smoothly on my sample and takes just one turn to go from infinity to it's closest focusing distance of 1.5 meters (4.92 ft). This is a pretty aggressive mechanism which does mean that you can quickly go from one end of the focusing plane to the other, but it is a little more tricky to get right when it come to fine tuning your focus. The diopter adjustment that allows you to adjust the lenses separately to allow for differences each of your eyes and plays an important part in correctly focusing your binoculars is on the right barrel. The ring is notched and has a marking to aid positioning. It was tight enough to ensure that it should not easily move out of place accidentally. Minox use what they call "an innovative sealing technology" that ensures that these 10x25's are both water and fogproof and can withstand moisture penetration up to a pressure of 0.3 bar or a comparable water depth of three meters. This also makes them suitable for extreme wind and weather conditions, something that would make them great skiing binoculars for example (They have an operating temperature	range of 14° up to 122° F / -10° up to +50° C). Remember waterproofing not only provides protection against water, but dust as well. They are also filled with dry Nitrogen gas that ensures permanent protection against corrosion and prevents fogging of the glass surfaces on the inside, even with severe and sudden temperature fluctuations. The 10x25 Minox binocular has twist out eyecups, with 4 click stops - flush against the eyepiece, two intermediate stops or fully extended. Non-eyeglass wearers will just use the eyecups in the fully extended position, whilst eyeglass wearers can adjust them to the stop that works best for them. These eyecups provide 15.5mm (0.61 inch) of eye relief which should easily be enough for the average eyeglass wearer to be comfortable. There is a small cover or cap on the front of the central pivoting point of theses binoculars that screws off and allows you to then screw on a binocular tripod adapter (not included) that uses the standard ¼-inch threading, which you can then attach to your tripod. The comfortable neck strap is of good quality and well padded and is more than adequate for a light compact binocular like these. The soft carry case is also well made and very well padded. You also get a lens cleaning cloth with these optics. What you don't get are lens and eyepiece covers, which I guess is to keep down costs. But to be fair to Minox, lens caps are often not included with compact binoculars in this price range. Highlights include their tough lightweight body that contains quality optics that produce a bright image with a wide fireld of view. Their minimum close focusing distance is also impressive. 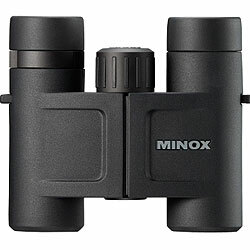 Priced at around $160 (£105 - £150), I think I have to agree with Minox in saying that these 10x25's do have and exceptional price to performance ratio. They are a great little pair of binoculars and I highly recommend them as a quality low cost compact pair of optics, the 10x magnification makes them more suited for wildlife observation and because they are tough, waterproof and very compact I highly recommend these as a great safari binocular, one to take camping, or indeed anywhere you go. If you are looking for a compact specifically for birding, you may wish to consider the 8x25 version that has a much wider field of view. 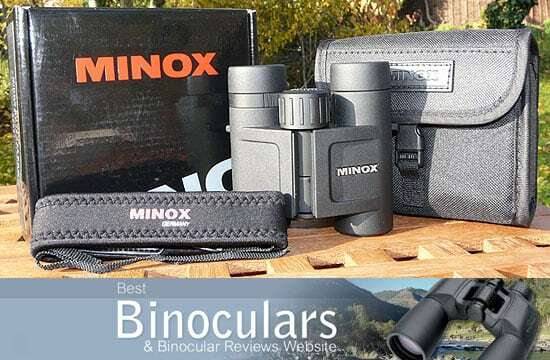 Discount Binoculars: These Minox Binoculars are available at a reduced price on Amazon in both the UK and USA. As well as Eagle Optics and Binoculars.com in the US.